The correct answer is Aspiration Pneumonitis (D). Explanations of the choices follow, and management of the patient is discussed at the bottom of the page. Don’t feel bad if you chose Pneumoperitoneum (A) – so did the hospital’s radiologist, initially. It would be easy for anyone who routinely reads x-rays, knowing the patient’s history, to worry about free air under the diaphragm. It certainly looks that way at first glance. However, look closely, and you’ll see you can trace bowel markings to the diaphragm (red arrows). A loop of bowel overlying the liver is causing the elevation of the right hemidiaphragm, mimicking pneumoperitoneum. This is called Chilaiditi’s sign. Note the patchy airspace opacities in the left upper lobe (yellow arrow). With the patient’s recent history of upper GI endoscopy, which is performed in the left lateral decubitus position (lying on the patient’s left side), there should be concern for aspiration of gastric contents. Classically, aspiration pneumonitis or pneumonia will be a right lower lobe process, due to the angulation of the bronchi. 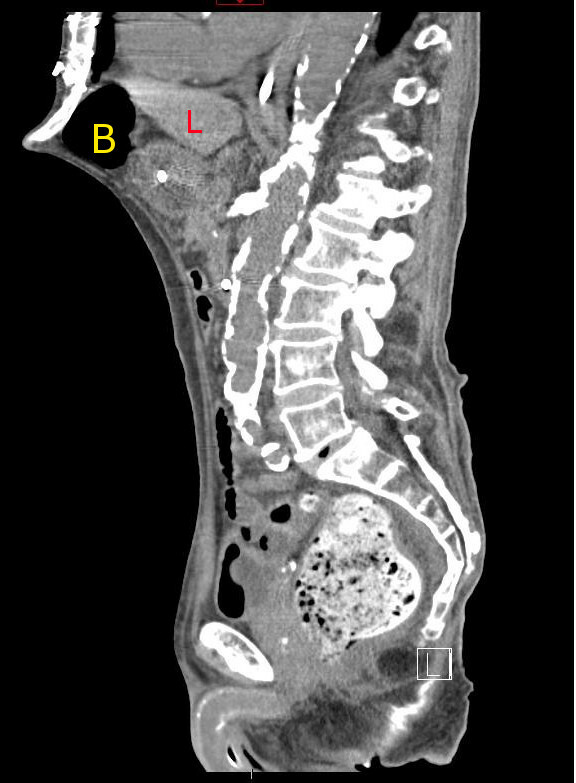 In this case, however, the patient’s positioning as well as sedation and the stenting open of his lower esophageal sphincter during the procedure would predispose him to aspiration on the left. Aspiration pneumonitis is an acute lung injury that occurs after the inhalation of caustic gastric contents (most often) or other chemical irritant. It commonly occurs after repeated vomiting, seizures, and in the elderly or patients with depressed levels of consciousness. Cough, tachypnea, bronchospasm, hypoxemia and/or respiratory distress peak 2-5 hours after the inciting event, as a result of direct damage to alveoli as well as an inflammatory response that limits the gas-exchange capacity of the lining of the involved lung. Treatment is mostly supportive, and does not require antibiotics. 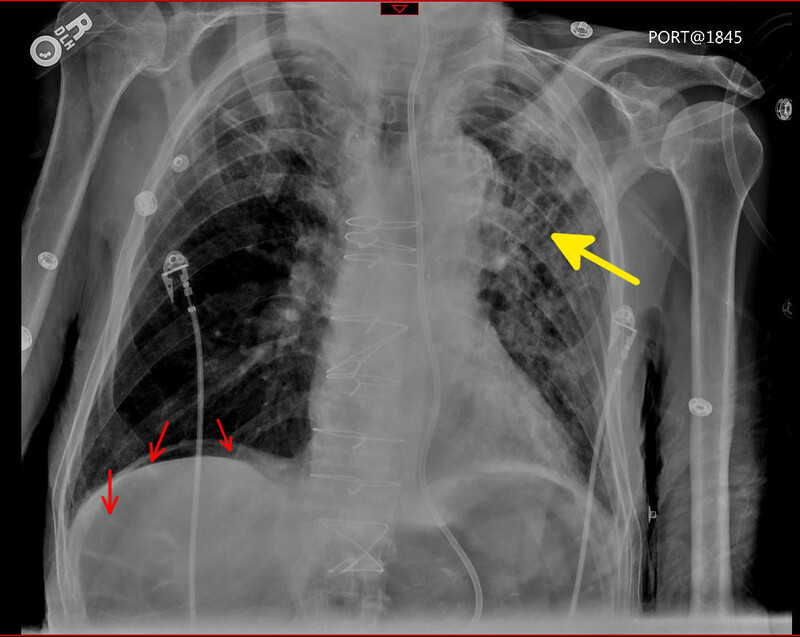 Pneumomediastinum (B) is not correct, as an esophageal perforation would cause the patient pain, and hyperlucency would be appreciated along mediastinal structures on the chest x-ray, with or without a pleural effusion. Pneumoperitoneum (A), as mentioned above, is a legitimate concern. However, the patient’s exam does not suggest peritonitis, and a bowel perforation should not in itself cause the patient’s oxygen saturation to fall. Aspiration pneumonia (C) is not the answer, as a true pneumonia (which this patient is still at risk for) would not develop so precipitously after the inciting event. Additionally, the patient is afebrile. CT of the abdomen was deferred in favor of stabilizing the patient’s respiratory distress and controlling his atrial fibrillation with rapid ventricular response (RVR). High-flow oxygen was delivered via face mask, and an aterial blood gas showed a PaO2 of 63 (low), but a hemoglobin saturation of 95%. The patient was administered 5mg metoprolol IV to control his heart rate, and given 10mg of lasix IV for gentle diuresis. Urgent surgical consultation agreed that bowel perforation was unlikely, and the ICU team was notified of the patient’s condition in anticipation of a potential intubation and transfer. Thanks for participating. If you would like to submit a case or guest post, please use the contact page.